I was working on some things this past weekend for a few upcoming projects, and one of those involves Azure and automation. Anyone who knows me is that I will praise when necessary, and call out when something is not quite right. Microsoft’s Azure, Windows Server, and SQL Server teams earned my “What Were They Thinking?” badge. What Is This About, Allan? Microsoft has published a few solutions to automagically build AG solutions for you (there are none for FCIs right now) up in Azure using IaaS VMs. The one below has been around for some time and is easily found in the Portal. No customer I know is going to build separate Active Directory Domain Services (AD DS) servers just for an AG; they’re going to have existing ones that they will use. The template only allows you to select Developer or Enterprise Editions of SQL Server, not Standard. Since this is a two-node only configuration, I’m not sure why this was not updated for SQL Server 2016 and later. You cannot choose what kind of load balancer thet gets created for the AG listener. No load balancer is created for the WSFC. 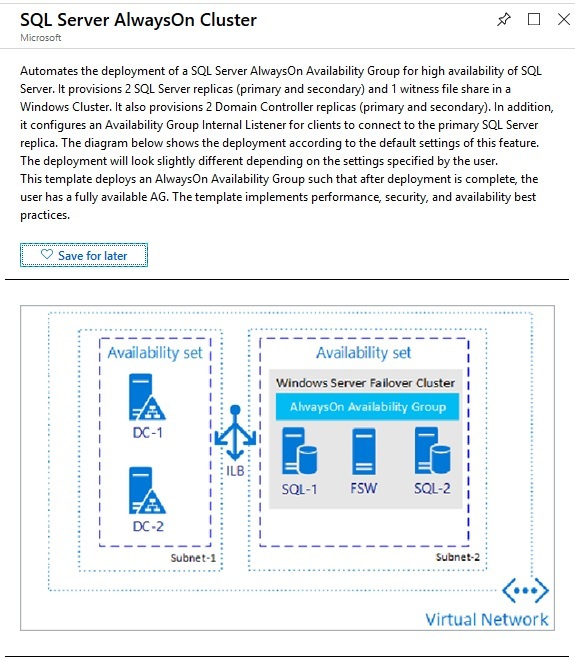 Some regions now have Availability Zones (AZs) which is better than Availability Sets (AS). The template has not been updated to reflect that. Cloud witness! ’nuff said. Building a FSW here is totally valid, but this is an Azure solution. This was built pre-WIndows Server 2016 which is when cloud witness was introduced. I ran the template and it took 1 hour, 1 minute, and 52 seconds to complete. In theory, this particular template is an ok(ish) solution if you want to kick the tires on AGs in a non-production way and see what they are all about without purely from an AG perspective. However, this solution they put together is VERY old (I think about five years at this point) and outdated, not to mention people generally deploy AGs after they have databases. If Microsoft wants people to use this, they should update it to reflect a more modern architecture and have the ability to use things like Standard Edition, AZs, and cloud witness. 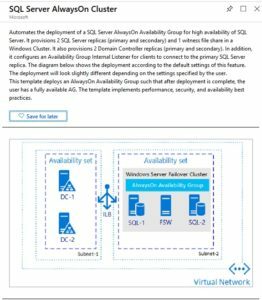 More recently, Microsoft released a few new things they blogged about the past few months: Automate Always On availability group deployments with SQL Virtual Machine resource provider from December 2018 and Simplify Always On availability group deployments on Azure VM with SQL VM CLI from February 2019. Sound off in the comments if you agree or disagree. I’m curious to see what people think. I had a good look at the Desired State Configuration (DSC) module for Windows Server Failover Clusters (WSFCs) which is called xFailOverCluster. This is mostly the heart of the matter. The latest version as of this blog post is 1.12.0.0. Specifically, I was seeing what it could and could not do, and there is one major chunk missing from it: validation. The big Azure template I complain about above also does not run validation. Why is this a bad thing? Knowing this, I would change all of this to build the AG (or FCI) VMs with the Failover Clustering feature enabled, then validate and build the WSFC inside similar to what is in the workflow for building the AG on your own. So it’s still a mix of automation and some minor human intervention. MSFT_xCluster also has another issue in my mind in parsing the code: it seems like it only handles Active Directory Domain Services (AD DS)-based WSFCs. If you wanted to build a Workgroup Cluster variant of a WSFC that does not require AD DS, you are out of luck. This is acknowledged in that MS blog post from February I link above, and at least they call it out. Kudos. All of this feels a bit like a case of fire, ready, aim, or more specifically – deploy, understand supportability, automate. Can You Still Automate AG Deployments Using What MS Provided? If you are looking at non-production environments such as development and QA, use anything and everything I criticize above since supportability generally is not an issue there. You’re not deploying production systems in the truest sense (i.e. end user/customer facing), but keep in mind they are production systems for your developers and testers. If you build the base Windows Server IaaS VMs and get through validation and want to automate beyond that, you’d have a fully supported solution if building the WSFC and AG portions are fully automated. That said, if you know what you’re doing, building all of this yourself won’t take much more time and may even take less time – especially the WSFC piece. You can automate it yourself in different ways. Building a WSFC really does just work these days when it’s done right (kudos to the Windows Server dev team and the HA PMs). Do what works for you; if what Microsoft provides works for you, go nuts. Just know there’s more than one way to approach this problem. Fix things so that Test-Cluster is run and the output is checked before building the WSFC and the AG. Should Microsoft deem it acceptable to support these automated methods already out there for production builds, they need to say that somewhere other than a blog post officially AND update KB2775067 accordingly that the validation requirement is waived. Otherwise there will be conflicting information out there which is bad for everyone including Microsoft. Microsoft needs to stop that nonsense right in its tracks. Update any templates and Wizards accordingly. When and if these things happen, by all means, automate away in Azure even for production! Need help with your availability solutions, especially if you are looking at any of the public clouds? Contact us today and we can kickstart your projects into high gear. Great post this as always and great insights, the options to automate in Azure using ARM templates etc has come a long way very fast, yet building a highly resilient ‘supported’ WSFC is something that should be done by someone competent and takes heed of best practices from MVP’s in the field such as yourself, not by someone whose job role is to just provision Cloud ‘resources’ that seems to be a more prevalent theme nowadays in Cloud computing and evolving roles.